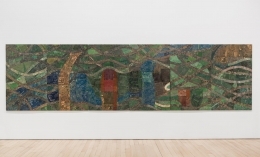 James Cohan Gallery is pleased to present the Ethiopian artist Elias Sime in his New York debut exhibition open September 10 through October 17, 2015. Sime is also a collector of histories and vernacular techniques. 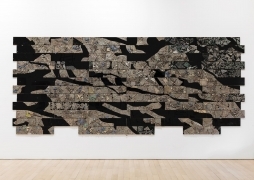 The methods employed in the stitched canvases and computer-part collages that will comprise his exhibition, range from assemblage to traditional Ethiopian braiding. 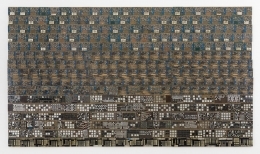 Sime’s most recent works from the series Tightrope are made from the cast-off innards of computers and machines. Braided wires form tight networks of colorful patterns and dismembered motherboards appear as cityscapes viewed from above. While the parts are formally striking, they also speak to the cost of “progress.” Discarded at the Merkato, the lead-ridden, often toxic materials attest to the pace of disposal as well as the danger posed to countries like Ethiopia, which often absorb the refuse of the first world. In works on dyed canvas from Sime’s What is Love and Ants and Ceramicists series, stitched yarn coalesces into sweeping abstract forms and shifting color fields. 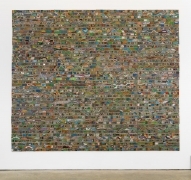 While largely nonrepresentational, the compositions snap into narrative focus with the presence of small insects, often ants or a dung beetles, swept up in the fiber pixels of the hand-stitched yarn. More minimal works become a universe unto themselves with Sime’s abstracted signature, a flattened bottle cap, forming a planet in the macrocosm of the picture plane. For Sime, the objects he uses are not trash: “I treat them like oil paint, acrylic or clay.” Once struck by an object, Sime will tirelessly collect his chosen material in pursuit of an idea: “The size of my art is determined by the idea behind the composition. If the idea overwhelms me, the size of the work keeps growing until I have said enough.” Moved by each object’s history, the hands through which each object passed, Sime’s work is a history of use and disposal, desire and disregard. While some emphasize the power and spiritual intensity felt when viewing Sime’s works, others note the figurative and abstract traditions of Ethiopia’s modern history, evident in the objects Sime creates. 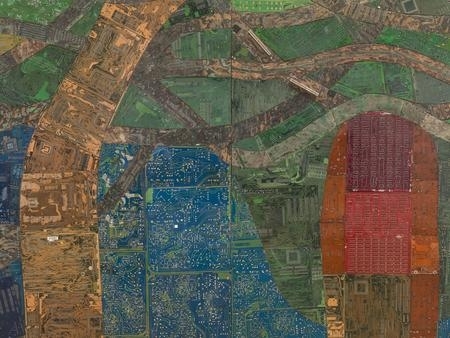 From social realism—a remnant of Soviet involvement in Ethiopia following the 1974 revolution—to mid-century abstract avant-garde movements imported from the west in the 1950s and 1960s, Sime’s art recycles forms as much as objects. Elias Sime (born 1968, Addis Ababa) is a driving force in the East African art scene. Active since graduating from the Addis Ababa University Alle School of Fine Arts and Design in 1990, Sime has become one of the most prominent artists in the region. In 2002 Sime co-founded, designed and constructed by hand, the Zoma Contemporary Art Center in Addis Ababa. Built and rebuilt by Sime in pursuit of perfection, ZCAC is both an international residence program and a gallery. In the past decade Sime traveled with noted anthropologist and Founding Director of ZCAC, Meskerem Assegued, visiting rural villages in Ethiopia to research ancient rituals still in practice. In 2008, Sime was included in the exhibitions Flow at the Studio Museum of Harlem and The Essential Art of African Textiles: Design Without End at the Metropolitan Museum of Art. 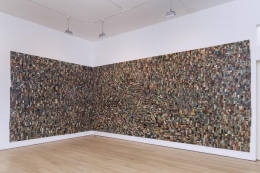 The artist’s work Selechas (2008) is a part of the Metropolitan’s permanent collection. In 2009 a survey exhibition of Sime’s work, titled Eye of the Needle, Eye of the Heart, traveled from the Santa Monica Museum of Art, California, to the North Dakota Museum of Art. Co-curated by renowned theater director, Peter Sellars, along with Meskerem Assegued, the exhibition included props designed by Sime for Sellars’ production of Igor Stravinsky’s opera Oedipus Rex. The opera has been performed internationally by the Los Angeles Philharmonic in 2009 and the Sydney Symphony and Philharmonia Choirs in 2010. Notable international exhibitions include the Dak’Art Biennale in Senegal and the New Crowned Hope Festival in Vienna.